Apple is a late starter in streaming music. But Apple Music has achieved a super fast glowing rate since its debut in 2015 with a large base of fans and brilliant ecosystem. And it is showing no signs of slowing down. The music category contains over 50 millions of songs which is not smaller than the main streaming services like Spotify, Google Play music and so on. The selling points of Apple Music are the Beats 1 live broadcasting radio, manually curated playlists and the artist-based social networking feature "Connect". 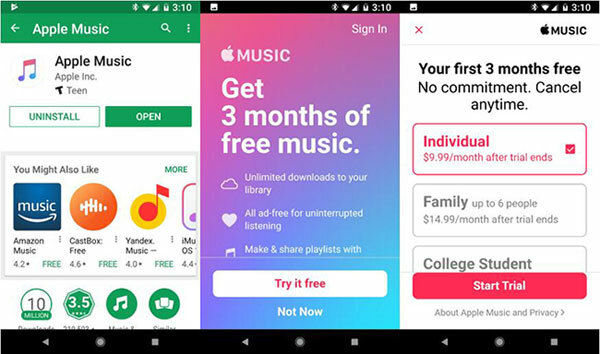 If you are new to Apple Music or want to switch from other music services, you can follow this tips to join and manage Apple Music subscription. Unlike the traditional record store or iTunes store, you don't have to buy each song separately. Apple Music offers several different subscription plans. You just need to join a subscription you want and you will get access to millions of songs. To select the right subscription will help you save your money. This is for personal use. You can install Apple Music app on multiple devices, but only log in one device at a time. If you are not a college student and want to get the service for yourself only, then this is the right option for you. If you are a college student, this subscription will help you save 50% but still enjoy the same privileges. To enjoy this discount, you need to provide the identification info such as the academic email with .edu suffix and so on at the first time. After subscribing, you can enjoy the discount for up to 4 years. This plan costs $5 more than the individual plan, but it can be used for up to 6 users. If you live with your family members, that is a perfect option to reduce the average subscription fee. After subscribing to this plan, you can send the invitation to invite your family members. This is a new subscription type. You can save up to $20/year if you join the subscription by year. But please note this offer can't be used together with the student or family plan. Apple Music can be played through the Apps on iOS, Android mobile devices as well as iTunes on computers. Please follow the instructions. 1. Launch Music app from your device, you will see the option to join Apple Music. 2. Click the menu "Try it free" to open the membership selection screen window. 3. Select the subscription you want and click "Free Trial". 4. You can click "Use Existing Apple ID" and then input your Apple account and password to log in. 5. Follow the screen instruction to add a valid payment method and click "Join". Apple Music for Android supports to run on Android 4.3 or above systems. 1. Download and install the Apple Music app from the Google Play store. 2. Launch the app, you can click "Try it free" from the main screen. 3. Select the plan that is right for you and tap "Start Trial". 4. You can input your existing Apple ID and password to sign in. If you don't have one, you can simply sign up one first. 5. Input your payment info and click "Join". If you'd like to listen to Apple Music on computers, you can use the iTunes. ITunes is already in Mac computers. 1. Launch iTunes from your computer. If you are using a Windows PC, please download and install iTunes from the Apple's official website first. 2. Go to the "Music" category and then click "For You" tab. 3. On the opened page, please click "Try it Free" to get started to subscribe it. 4. 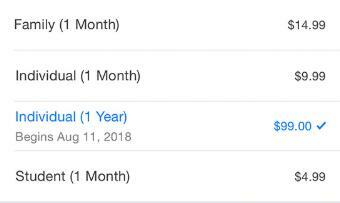 Click the menu "Account" > "Apple Music" > "Get 3 Months free". 5. You can select the subscription plan you want and input your payment info to complete the subscribing. Apple Music doesn't have a free tier service, but you can try it out for free for 3 months. If you find that it is not the streaming platform you like or whatsoever, you can cancel the subscription, change the subscription type or join an existing Family plan. You can cancel Apple Music on any devices you have used it on. The instruction is more or less the same. Here I take iPhone for example. 1. Go to settings > [your name] > iTunes & App Store. 2. Tap your Apple ID from the top of the screen, it may require you to sign in with the password. 3. Tap your Apple Music subscription. 4. On the opened page, you will see the options to change your plans or cancel Apple Music membership. Note: Canceling the membership will lose all your curated playlists, songs immediately. If you'd like to get Apple Music free forever, you can use the third party DRmare Audio Converter to help you remove FairPlay DRM protection. If one of your family members has already subscribed to the Family subscription, you don't need to pay the full subscription fee anymore, just follow this tips to join the Family plan. 1. Ask the organizer of the Family to send you the invitation to join the group. 2. Follow the instruction from the invitation email to accept the offer. 3. Now you can sign in the Apple Music app to start to enjoy music with the account you have already set up.